Longtime Republican operative Beth Lindstrom, a former senior aide to Mitt Romney and manager of Scott Brown’s victorious Senate campaign, said Wednesday she is considering a challenge to US Senator Elizabeth Warren. Lindstrom has held a series of conversations with top state Republicans about the prospect of seeking the party nomination and is leaning toward running, according to several people familiar with her thinking. “I am actively exploring a run for US Senate,” Lindstrom wrote in an e-mail. “I’m a wife and mother with three kids who cares deeply about our state and where we are heading as a country. So much of our politics these days is pointless bickering. Lindstrom would be at least the fourth Republican candidate actively campaigning or moving toward a run against Warren. All the others are men: Shiva Ayyadurai, state Representative Geoff Diehl, and businessman John Kingston. She has consulted with several veterans of Romney’s political orbit, GOP sources said, including Eric Fehrnstrom, Peter Flaherty, Gail Gitcho, and Rob Willington. Lindstrom, who lives in Groton, was executive director of the state Lottery during the 1990s and, later, chief of consumer affairs and business regulation during the Romney administration. 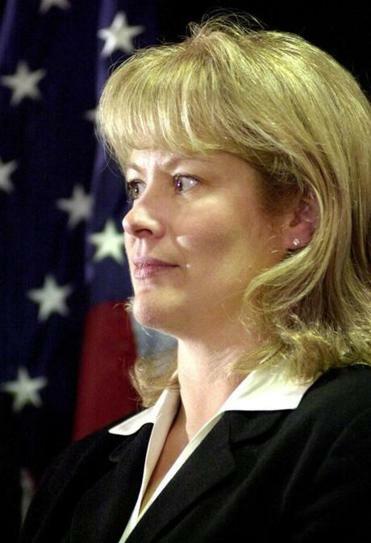 The first female executive director of the state Republican Party, she was Brown’s campaign manager during his 2010 special-election win over then-Attorney General Martha Coakley. During the 2014 cycle, she led Commonwealth Future, a super PAC backing Charlie Baker against Coakley. According to the Center for Public Integrity, the group took in most of its money from the Republican Governors Association and spent $7.6 million on TV ads, $4.8 million of which went to negative ads targeting Coakley. Her LinkedIn profile says Lindstrom, who has an MBA from Northeastern University, had previously been involved with online startups. She will be a familiar face to many Massachusetts voters. She appeared at the close of Commonwealth Future ads in 2014, delivering the standard disclosure of who approved and paid for the message. Like Kingston, Lindstrom would represent the Romney/Baker wing of the party, while Ayyadurai and Diehl have carved out more populist profiles. Republicans acknowledge that Warren, a leading national figure on the left, poses a tough challenge for whomever emerges from the GOP primary in 2018. But he said Diehl was “the odds-on favorite” to win the primary, where the party’s more hard-core conservatives generally vote. The more right-leaning grass-roots also wield tremendous influence at the party convention earlier in the year. “He’s been out there with activists, and people have to remember that the primary electorate is different than the general electorate,” Tisei said. Diehl is set to formalize his campaign next week. Kingston’s website says he “is running,” and he is holding an event for supporters next week at a Boston steakhouse.